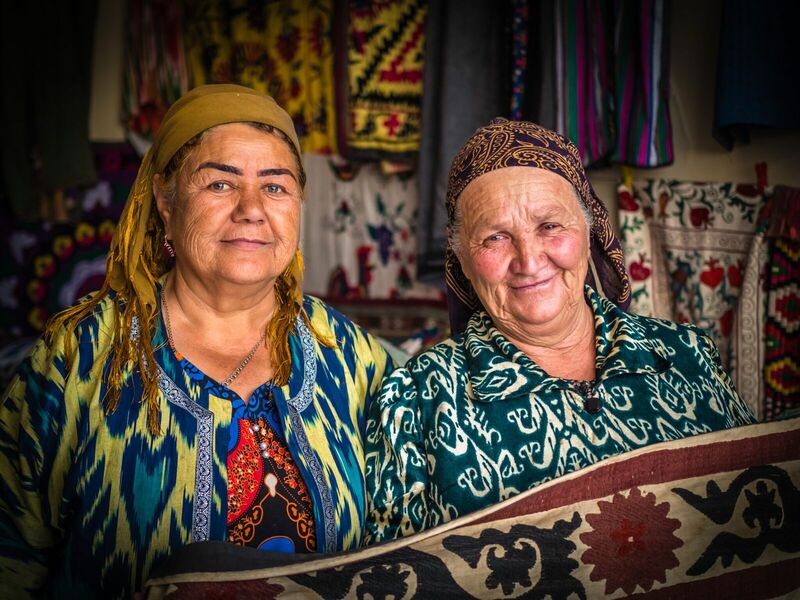 Uzbek Journeys will offer two of its "one-of-a-kind" tours in 2019. 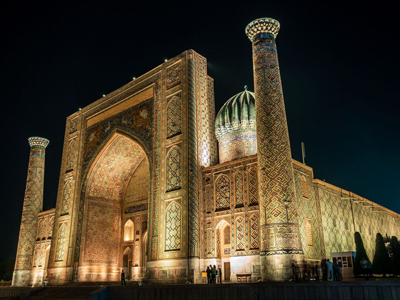 The 16-day tours, scheduled for the very best seasons in Uzbekistan, focus on the history, architecture, and art and craft of this fascinating section of the Silk Road. Central Asia is a region steeped in history and romance: Alexander the Great and Genghis Khan visited. Amir Timur (also known as Tamerlaine), Uzbekistan’s national hero, founded his empire here. Along the trails of the Great Silk Road prosperous cities such as Tashkent, Samarkand, Bukhara, Shahkrisyabz and Khiva sprang up. The finest craftsmen in Asia constructed majestic palaces, minarets, madrassahs and mosques: many of these monuments today are inscribed on UNESCO’s World Heritage list. Mathematicians, astronomers and scholars gathered in these cities: it was the greatest flowering of Islam in the Muslim world. Each of these unique cities deserves time. Not just to admire the architecture, but to wander the streets, visit artisans’ workshops, stroll through gardens, climb minarets, spend time sipping tea in Uzbek chaikhanas, enjoy the markets piled with astonishing goods, learn about the Russian and British players of the Great Game and even enjoy a scrub and massage in a 16th century hammam. An outstanding Uzbek guide leads the tours. A guide makes or breaks this sort of journey and Mirza is brilliant. As well as in-depth knowledge of the history and culture of his country, he is good-natured and caring. In 2019 Penelope Price will also accompany both tours. Hotels, although not deluxe, are chosen based on location, quietness and atmosphere. They are often family-run. Of course private bathrooms are included, though not at the yurt camp. There is time to explore and wander. Other tours of Uzbekistan are usually around 9 days: Uzbek Journeys style and pace ensures you are not packing and unpacking daily. However, please remember that distances can be long and roads poor. Uzbekistan is a complicated country to travel in at times: the Uzbek travel agency that coordinates the tour is professional and reliable. The posts elsewhere on this website supplement the information below about the art, history, craft and culture of Uzbekistan. The regularly-updated FAQ section provides answers to questions about flying to Uzbekistan, visas, climate, packing, health etc. Depending on your flight schedule, you may also consider excursions to the silk and ceramic centres of the Ferghana Valley, or the fascinating, ancient Buddhist and Islamic sites around Termez. Do consider spending extra time in Tashkent. It is an interesting city to explore and you will find many posts about things to do in Tashkent on this website. Note: If you would like a tailor-made tour to Uzbekistan, just for you, or for a couple or small group, please contact Uzbek Journeys. All 2019 Uzbek tours are 16 days/15 nights and start and finish in Tashkent. The itinerary below is the same for both tours. Maximum group size is 13. Eight places on each Uzbek tour are reserved for clients who also book a Kyrgyzstan tour scheduled to precede or follow the Uzbek tour. 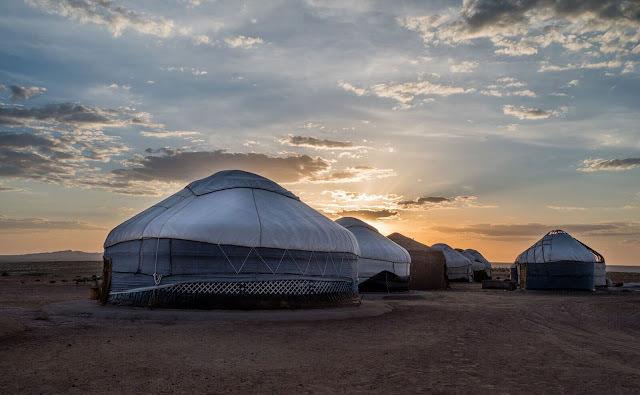 View the 2019 Kyrgyz tours. Tours will be led by the outstanding Uzbek guide Mirza Ruzmetov and will also be accompanied by Penelope Price. 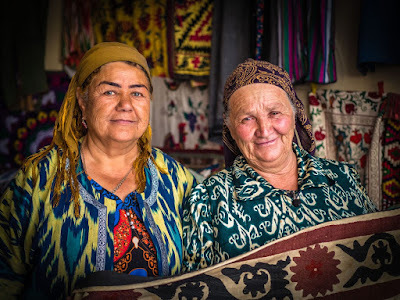 Note: For travellers who join both the Kyrgyz and Uzbek tours in September 2019, there is a 4-night gap in Uzbekistan between tours at your own expense. This is due to Uzbek Airways flight schedule from Bishkek to Tashkent. Uzbek Airways usually publishes its schedule in January, so there may be less time in Tashkent if the schedule changes. It is an interesting city to spend time in - in September the theatre, opera and ballet seasons open again. The weather is good and the harvest fruits and vegetables are plentiful. Other clients have taken this opportunity to explore the Ferghana Valley or the Buddhist and Islamic sites of Termez. Some have hiked in the Chimgan mountain region, not far from Tashkent. Note: The itinerary below is the same for both 2019 tours. You will be met at the airport and transferred to your hotel. (Check in available after 12:00 noon). There are no activities arranged this day. After breakfast, depart around 9:00 a.m. for all-day sightseeing. Tashkent is a green, wide-avenued city rebuilt in the 1960s following the devastating earthquake of 1966. It was the 4th largest city in the Soviet Union. Spend the morning at the Applied Arts Museum. The wealthy Tsarist diplomat Alexander Polovtsev, a connoisseur of Oriental architecture and decorative patterns, invited local master artisans to decorate his private mansion. It now houses a splendid collection of ikat fabrics, suzani, ceramics, metal work, carved wood, carpets and national garments. It is an excellent introduction to the applied arts you will see during the tour. After lunch visit a contemporary woodblock printer in his studio in the old city. 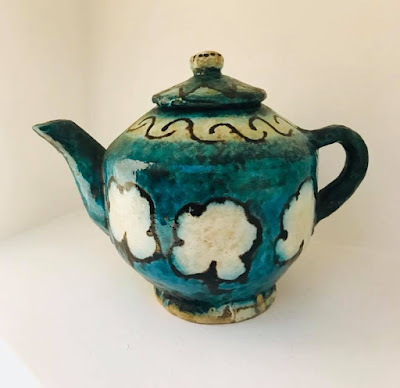 Then visit a fabulous embroiderer's workshop and end the day with a tour of an outstanding ceramic workshop. Start the day by travelling on the excellent Tashkent metro, stopping off at several stations to admire the beautiful platform decorations. Then catch the metro to Chorsu Bazaar, Tashkent’s largest market, in the old city. Plenty of time to explore Chorsu's different sections. In the afternoon, visit the Earthquake monument and leafy Golubie Kupola Park and its second-hand book sellers. 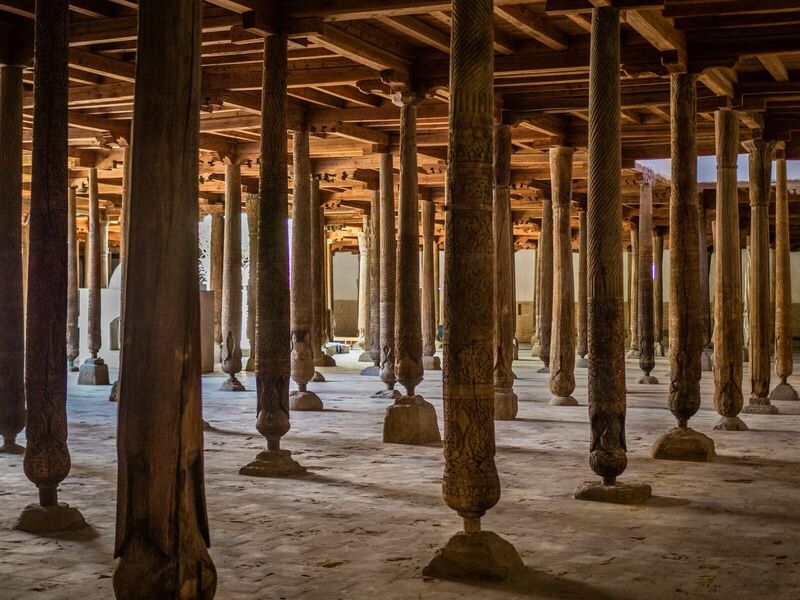 End the afternoon with a visit to the 19th-century Abulkasym madrassah, where wood carvers and miniature painters continue the fine traditions of their ancestors. The opera, music and ballet program of the Alisher Navoi theatre is usually available 4 weeks in advance. If there is a performance, for those interested, tickets are around US$10. Performances start at 7:00 p.m. The famous Ilkhom Theatre, the Soviet Union's first experimental, independent theatre has some programs with English surtitles. The program is usually available online 4 weeks in advance. 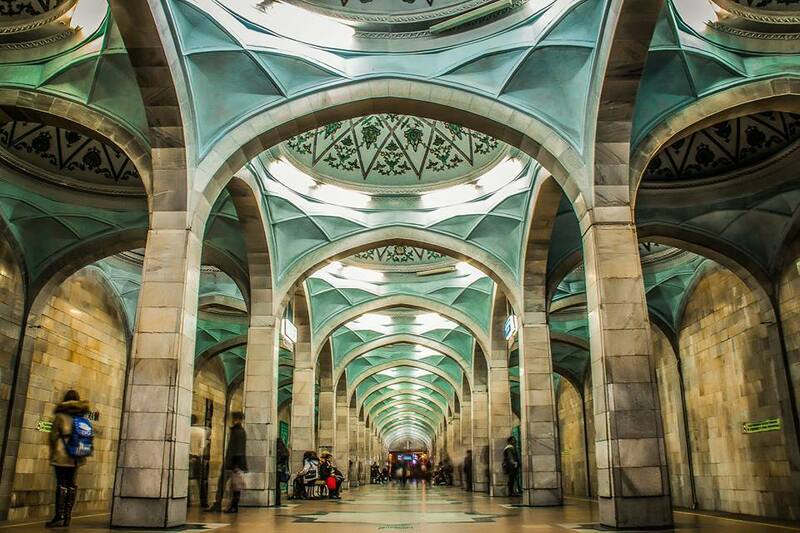 Alisher Navoi metro station, Tashkent. Named as one of the 15 most beautiful metro stations in the world. It will be an early start to catch the fast, Spanish Talgo train from Tashkent to Samarkand. Rail travel will ensure maximum time in 'golden Samarkand'. The family-run hotel is a 5-minute walk from the Registan, Samarkand's famous square . Visited by Alexander the Great, turned into a centre of learning by the Arabs, then laid waste to by Ghengis Khan, Samarkand reached its peak as the capital of Timur’s empire during the 14th and 15th centuries. It was a jewel of the Silk Road, famous for the products in its bazaars, its scholars and artisans, and for its extraordinary monuments. 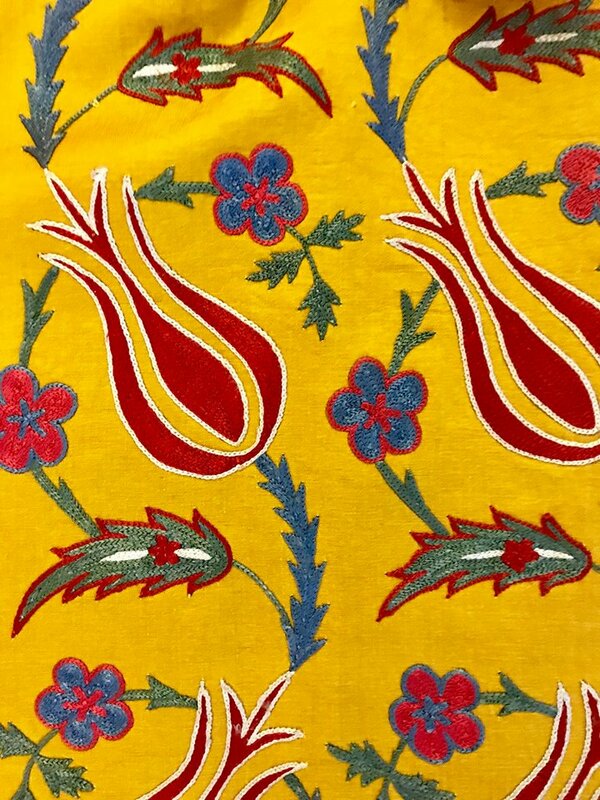 Today you will visit the famed Registan complex, the Samarkand bazaar, Bibi Hanum and the workshop of Nargis Bekmuhamedova, a designer who reworks new and antique silk ikat fabrics and woodblocks into fabulous clothing and accessories. In the morning you will visit other significant Samarkand monuments: Gur-Emir, Ulughbek’s observatory and the ruins of the ancient Sogdian city of Afrosiabs. 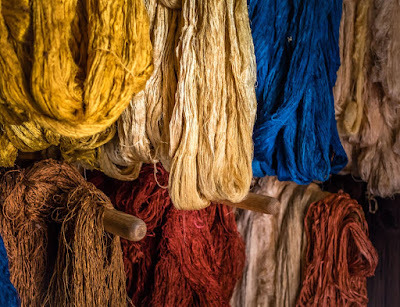 Also visit a silk carpet factory that uses only natural dyes (onion skins, madder, roots, walnut shells, pomegranate etc). You will view the entire process of silk dyeing, design selection, weaving at the loom. Late afternoon, when the light is softer, visit the necropolis of Shah-i-Zindar, with its extraordinary tile work. Today you will travel by sedan cars to Shakhrisabz, birthplace of Amir Timur and a World Heritage site. (Sedans are more comfortable and much faster). Drive via the mountain road with beautiful views of the Zeravshan range. Visit the remains of Timur’s Ak Saray palac, the Kok Gumaz mosque and Dorut Tilovat. The palace portal is astonishing and permits a rare view of original, 14th century Timurid tile work. 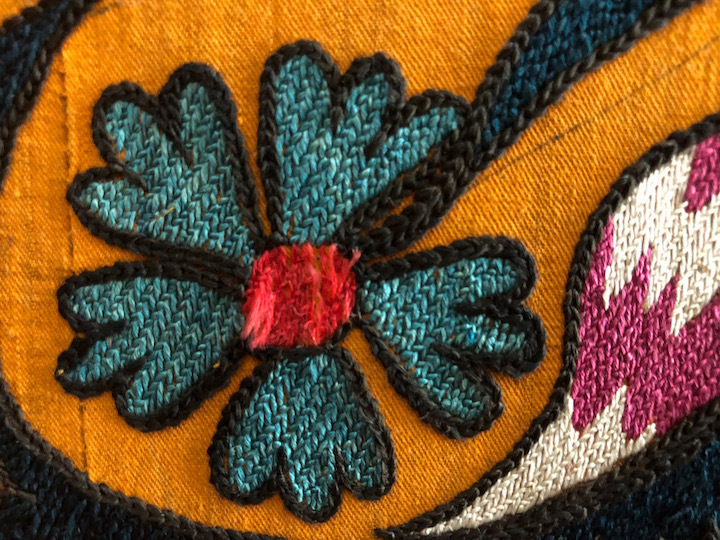 The area is also famous for its distinctive embroidery style. Urgut, 40 kms from Samarkand, claims to be the oldest extant market in Uzbekistan. It’s an exciting, bustling place where you can find vintage textiles, jewellery, hats, traditional shoes etc. The Sunday market is the busiest day with the greatest range of products. Prepare to haggle hard! After the market visit the Oblakoulov family’s ceramic workshop. Urgut ceramics are traditionally brown, green, mustard and pale lemon; Mr. Oblakoulov’s family has been potters here for over 350 years. The women in the family produce beautiful embroidery pieces with traditional Urgut motifs: all silk threads, often in unusual pastels, are made of natural dyes. On the way back to Samarkand stop at the paper making workshop in Konigil. Thanks to a UNESCO project, the ancient paper making art using a water mill and traditional techniques has been revived. Dine one evening in the restored wing of an old, private residence and listen to the remarkable tale of how this house was saved from demolition and restored by Samarkand's finest artisans. (About US$10). Catch the mid-morning, fast Talgo train to Bukhara. Briefly stop at the Kagan Russian orthodox church of St Nicholas dating from 1892. It has been extensively rebuilt and was reconsecrated in 1969. Later in the afternoon check into your hotel. Then the alleyways and tea houses of Bukhara are yours to discover. 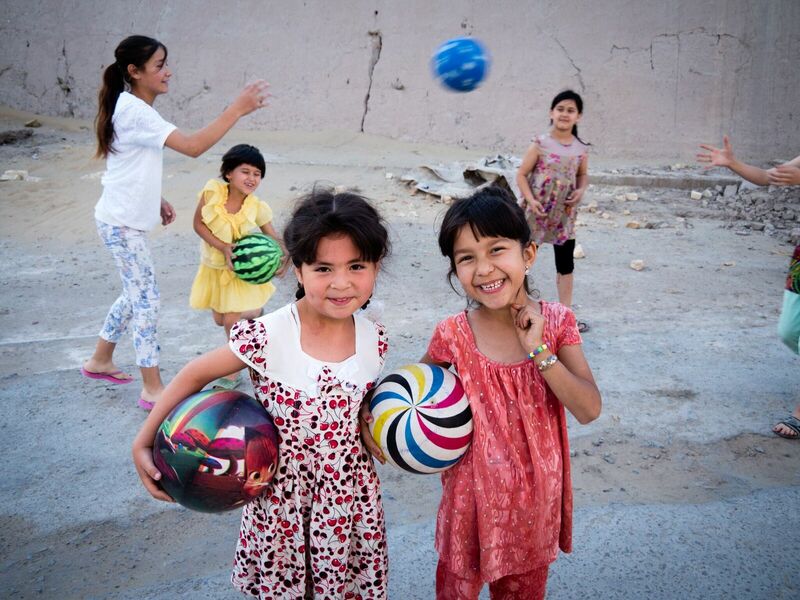 A traditional Arabic saying states ‘Samarkand is the beauty of the earth, but Bukhara is the beauty of the spirit.' 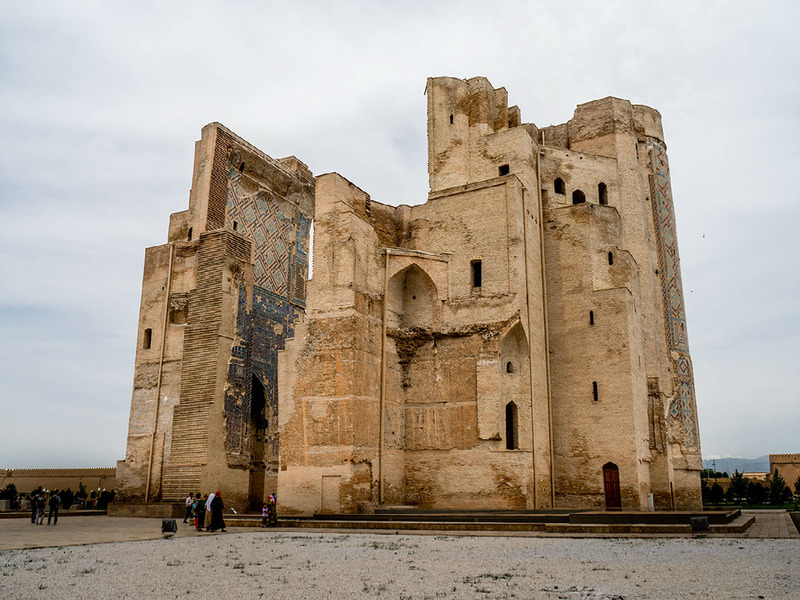 At the turn of the 1st millennium, Islamic scholars believe that Bukhara housed 365 madrassahs supporting students from as far away as Andalusia and Yemen. Bukhara was the forefront of the teaching of astronomy, philosophy, mathematics and medicine. 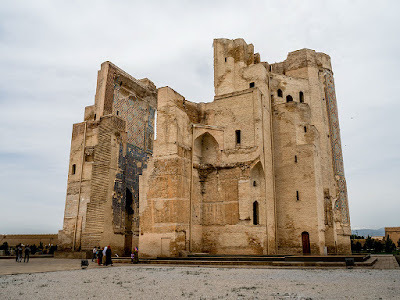 Bukhara is also the city where Charles Stoddart and Arthur Conolly met their deaths at the hands of the gruesome emir Nasrullah Khan during the Great Game between the Russian and British empires. You will spend 2 days here visiting architectural wonders such as the 9th century Ishmael Samani Mausoleum, a perfect cube made of baked bricks in basket weave pattern. Other sites include Bolo Hauz mosque, the Kalon minaret (which served as a beacon on the Silk Road), the Ark fortress, the Registan area and the last Emir’s summer palace. This palace, an over-the-top Russian/Central Asian confection built in 1911, also houses the excellent Bukhara Museum of Decorative Applied Arts. Bukhara is a city to discover on foot, roaming the back streets. There was once a flourishing Jewish community: one synagogue, which you will visit, still operates. Crafts people fill the former caravanserais and madrassahs with marvellous carpets, woodcarvings, silk weaving, suzani, wood block printed cottons, gold embroidery, jewellery, metal work and skullcaps. There are lots of antiques and collectibles here. You will visit a private and fabulous textile and ceramic collection -- yes, pieces are for sale -- and also enjoy an ikat weaving demonstration. Note: The fast train is being extended from Bukhara to Khiva. Its operational start date and timetable, is, at the time of writing, unknown. If it is up and running at a suitable time for the tours, then we will use this transport and there will be an additional fee. (Refer exclusions below). This is a long day’s drive: 470 kms along the Kyzylkum desert road and crossing the Amu Darya river, known as the Oxus in ancient times. (Because the road is still under reconstruction it may be necessary to hire sedan cars at an additional cost of US$50 per person). This supplement will be collected locally. It will reduce travel time to around 7 hours versus 10+ by minibus. Unfortunately there are no regular flights between Bukhara and Khiva. However, the desertscape is compelling: vast steppes, shepherds and their flocks, odd villages, military outposts, surprising vegetation. You will either stay in a small hotel or a family guesthouse, both within the old city's baked mud walls. Khiva, once famous for it slave trade and ruthless emirs, is the most intact and the most remote of Central Asia’s Silk Road cities. The Soviets removed the residents, restored the city and made it an "open air" museum. Happily, since independence, families have moved back and life again vibrates within the baked mud walls. The old town is only 26 hectares, however, it is packed with interesting buildings and wonderful craft studios. It is a place of extraordinary wood carved doors and magnificent tile work. 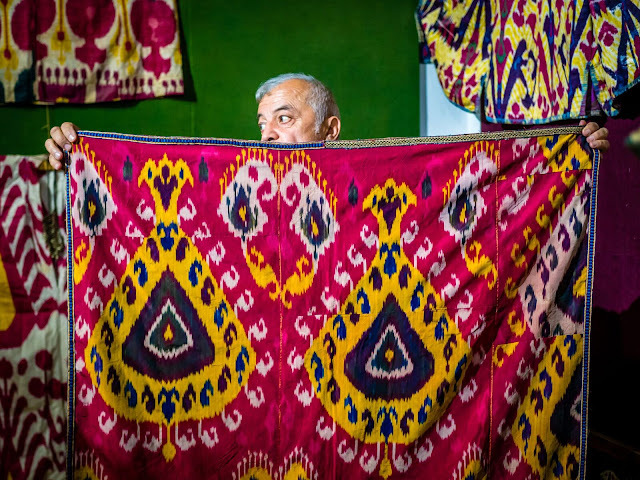 There is a wonderful carpet shop in Khiva: unique silk carpets inspired by the designs of the tiles and doors of the city. You will spend two days exploring Khiva and visiting Juma Mosque, Kukhana Ark Shir, Gaza Khan Madrasa, Islam Khwaja madrasah, Tosh Khovil Palace, Mausoleum of Pahlavan Mahmud, and the nearby Nurullah Palace, Atajan Tura mosque and madrassah. Head out early morning from Khiva for a 3-hour drive west to Nukus. 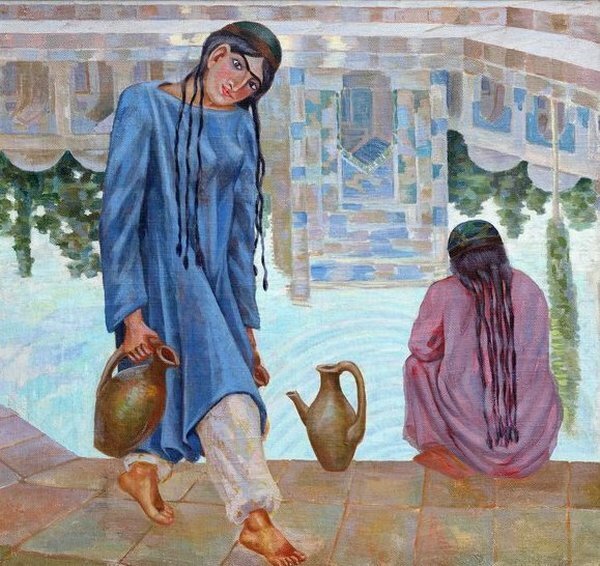 The purpose of visiting this remote city is to tour the extraordinary Savitsky collection, the second largest collection of Russian and Uzbek avant garde art in the world. 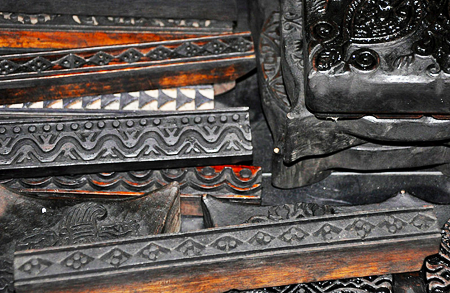 The Karakalpak museum also houses a vast ethnographic collection of pile rugs, flat weaves, embroidery, appliqué work, jewellery and hand-made textiles. You will spend most of the day there. It is one of the major highlights of the journey. An award-winning documentary Desert of Forbidden Art was made in 2009 about the remarkable collection and the obsessive collector, Igor Savitsky. You can view the trailer and also consider purchasing a copy. 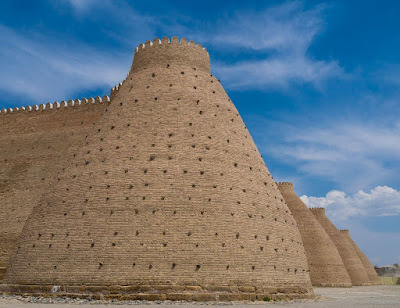 Depart the museum late afternoon to travel to the Ayaz Kala desert fortress complex on the Khorezm section of the Great Silk Road. After breakfast, tour the nearby Red Fort by foot, which dates from the 4th century BC. Leave late morning for Khiva, where you have the afternoon free for roaming or shopping prior to the evening flight back to Tashkent. Pre-booking dinner for the evening of your arrival after the exhausting road trip from Bukhara to Khiva. The Khorezm Art café serves delicious soup and a dill noodle dish with chickpeas. (About US$10). Perfect for weary travellers. 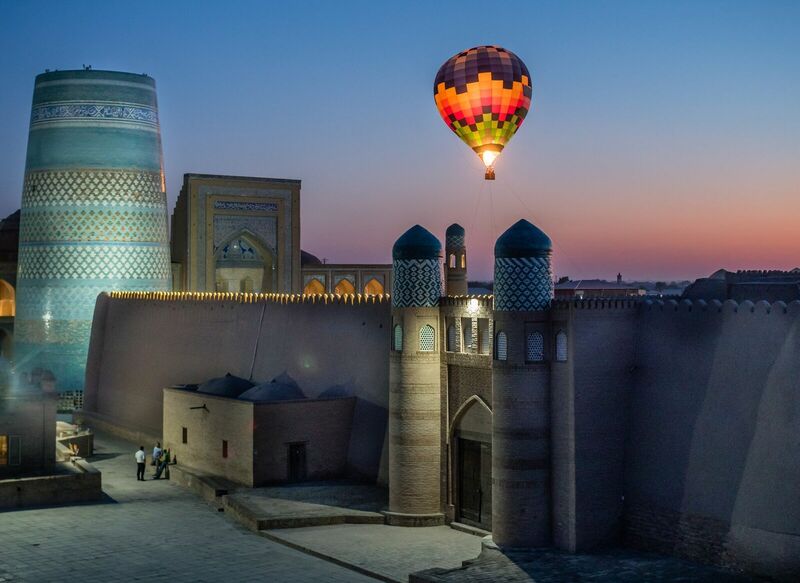 A roof-top dinner in Khiva enjoying sunset views of the magnificent domes. (About US$10). The tour ends today. It will include a visit to the Museum of Victims of Repression, dedicated to the suffering of Uzbeks during the Russian and Soviet periods. Many exhibits draw on information culled from the former KGB archives. Then visit the Barak-Khan Madrassah complex in the old city to see the world's oldest Koran. For those with evening flight departures from Tashkent today, late check out and airport transfer are included. Prices: The cost per person for tours #1 and #2 is US$3100, based on a twin share room. Single supplement is an additional US$375. Tashkent airport transfers on days 1, 15 and 16. (If you arrive earlier or leave later, there will be an additional transfer fee of US$20 each way). Lunches and dinners except dinner at the yurt camp. Although there are options for special lunches and dinners noted in the itinerary above, some people don’t necessarily wish to spend every meal with everyone! The choice is yours to discover local cafes or simply snack on fruit, cheese and crackers, and Uzbek beer in the courtyards of the hotels. Budgeting US$8-10 for lunch or dinner is ample. Entrance fees: Uzbek site and museum entrance fees have increased. To save time queuing, museum, site and workshop entrance fees will be collected on the morning of Day 2. Total is around US$100. Photography and video fees can only be paid on the spot. These are generally around US$2. However, in the Savitsky Museum in Nukus the photography fee is US$35. Tips for guides and driver - I will discuss these during the Skype briefings. Travel insurance: comprehensive travel insurance, providing cover against personal accident, death, medical expenses and emergency repatriation is a condition of participating in this tour. It is strongly recommended that it also cover cancellation, travel interruption, personal liability and baggage loss. And, you should also consider that it is not possible for Penelope Price, operator of Uzbek Journeys, to obtain Public Risk cover for risks outside Australia. Therefore it is not possible for you to rely on any such cover. Please arrange this with your flight booking agent or your insurer. Details of your insurance cover must be provided at the time of final payment. The tour includes walking (and standing) within ancient cities and sites, sometimes in strong sun. There are no lifts in the hotels where you stay, and sometimes staircases are narrow and steep. Hotel staff are available to assist with baggage - and a small tip would be appreciated. It is your responsibility to advise Uzbek Journeys of any pre-existing medical condition and/or disability that might reasonably be expected to increase the risk of you requiring medical attention, or that might affect the normal conduct of a tour and the enjoyment of other trip members. Please read carefully the Terms and Conditions explained separately on this website. By booking a trip with Uzbek Journeys (ABN: 72818242110 , Travel Agents Licence 2TA0882) you are deemed to have agreed to these Terms and Booking Conditions and, provided there is availability, your booking will be accepted on this basis. Please review carefully the terms and conditions. Then contact me to check the availability of the tour. If available, I will forward you a pdf file containing the terms and conditions, booking form and participant declaration. A strictly non-refundable, non-transferable deposit of A$800 per person will secure your spot. Your deposit will be converted into US$ based on Westpac Bank's A$-US$ telegraphic transfer rate of the date when the funds are deposited. You will then be advised of the US dollars balance. Uzbek Journeys is an online travel agency only. There is no facility to accept bookings from participants who do not have regular internet and scanner access. All documentation, updates, visa forms etc are sent and received electronically. I look forward very much to introducing you to Uzbekistan.